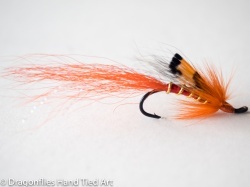 THE STOATS TAIL SALMON FLY PATTERN This is a very effective solid, dependable, traditional Atlantic salmon and sea trout pattern. This fly derived its name from the fact that it was first winged with the black tip of a stoats tail now dyed bucktail is preferred. The dark silhouette it creates works in crystal clear summer level water as well as the colored water of a spring flood. The North American steelhead Black Bear fly has more than a passing resemblance to the Stoat's tail. It is a good bet when the fish refuse the more gaudy patterns and during times of low water disinterested fish. There is debate over it's origins. In "Trout and Salmon Flies" by Sutherland and Chance it is listed as originating at Park on the river Dee in Scotland. 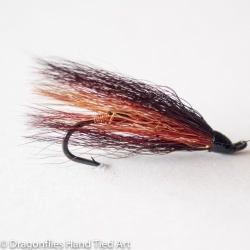 In the "Encyclopedia of Fly Fishing" by Conrad Voss Bark the Stoats tail is credited to James Wright of Sprouston-on-Tweed (Scotland) made during 1870-80's. Nowadays it is given a dyed bucktail or black squirrel wing. The salmon do not appear to notice the difference as it is still a very productive salmon fly. 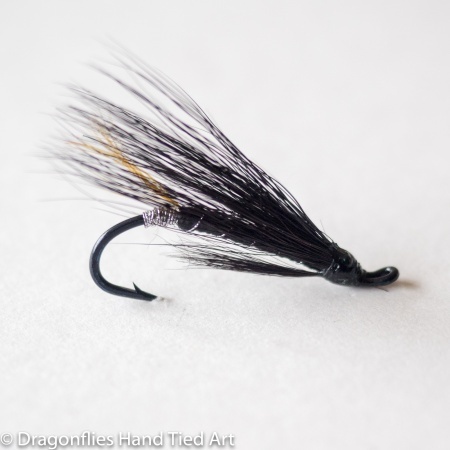 This black fly can be irresistible to salmon, Steelhead and sea trout in difficult summer conditions of high water temperature and low levels. It is also very popular in big clear water rivers. This fly will take both 'stale' and 'fresh' fish in all hook sizes and weather conditions. It is a good all-round fly.